This is a truly exciting time to be at CrackBery.com! New BlackBerry smartphones are on the way. I may not be conveying the proper level of excitement; let me try again. Faster processors with nearly double the computing speed of any BlackBerry currently on the market. More RAM. Increased storage. Magnetometers, augmented reality. NFC chips. 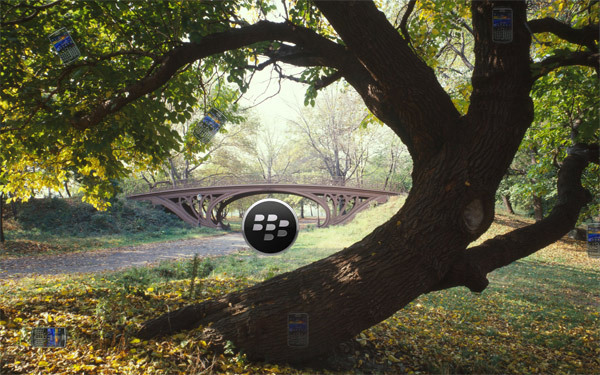 New, awesome, kick-buttBlackBerry devices are coming! I am incredibly excited for all the ‘Berry's coming our way! But it's not just the hardware that's exciting. 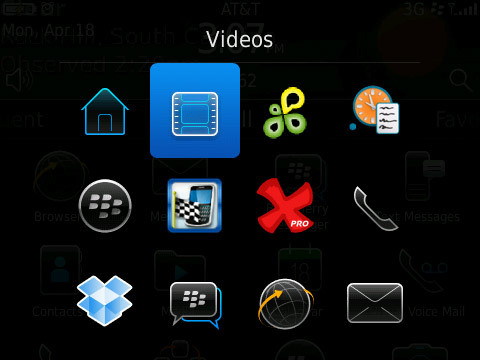 The BlackBerry OS 6.1 brings with it all new capabilities and improvements. And surprises. Not everything a BlackBerry can do is written out in the manual; it's just not practical to include every piece of trivia. For me, filling in the gaps is fun. I love that "I didn't know I could do that" moment; I even mentioned it on the last podcast. Some features are buried in a menu or locked behind cryptic keyboard combinations. I remember - and this was before I really started to explore CrackBerry.com - finding out about Copy & Paste. I had somehow managed to select some text, and I was really wishing I could press Control-C and copy this text to an email. 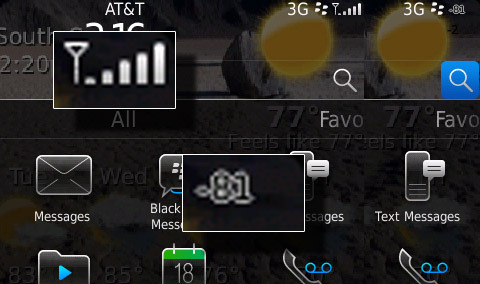 Like many BlackBerry users, my first though was maybe there's an option in the menu. Not only was there an option to copy, but it was already selected. My BlackBerry knew what I was trying to do before I did. That's probably when it started, my wonderful CrackBerry addiction. 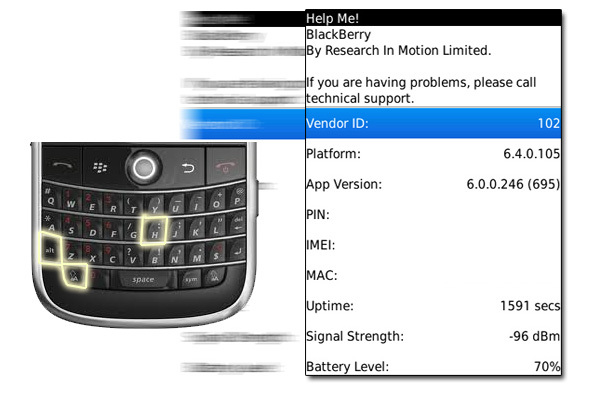 I began to look for more hidden tricks to my BlackBerry. Follow me after the break, I'll share a few of them with you. My favorite trick so far. The Help Me! Screen gives you a ton of useful information about your BlackBerry. PIN, IMEI, OS Version and more are included in this little screen, and it's dead easy to get to. On your BlackBerry's keyboard, press the left shift key, the alt key, and h. You don't need to press them simultaneously, but all three keys need to be depressed. My second App Switcher trick comes courtesy of @BlackBerry; it's actually what got me started on this article. As you can see up there, all you'll need to do is hold down the alt key and press the Escape (Back) key. The app switcher will open. Keep holding alt. Each time you press the escape key, the next application is highlighted in the list. Those signal strength bars never tell the whole story; ever curious about what your wireless signal strength really is? On you BlackBerry keyboard, hold the alt key and type N M L L. This will change your bars into numbers. You'll notice it's always a negative number; through a quirk in science and math a signal of -100 is better than a signal of -50, though anything in between should give you decent coverage. To change back to the signal bars, do the same thing again. Hold alt and type N M L L.
There are many, many more shortcuts to find, but we've come to the end of this article. Where do we go from here? I set you a challenge, CrackBerry Nation. 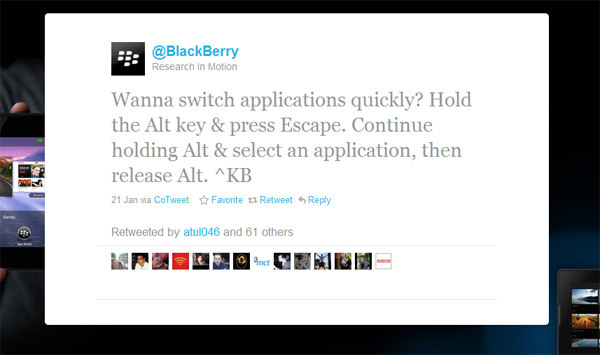 When those BlackBerry 6.1 phones get released, there's bound to be more of these tips and short cuts. Help me find them all. Make a post in our forums, Tweet it to the world, send us an email; any way you please. Together, we can make the biggest, baddest, most comprehensive guide to BlackBerry tips that the world has ever known!! Perhaps I got a little carried away with that one; but please, help me catch 'em all.